While far cheaper than opening a traditional brick-and-mortar restaurant, starting a food truck business typically still requires significant investment. Outfitting a new truck can cost anywhere from $30,000 to $100,000, so start with a good business plan and a realistic budget. Food truck startup costs vary from state to state, depending on licenses, permits, and other fees. For a simple truck, with a minimal mobile kitchen and storage, you could get started with as little as $30,000 or $40,000, to cover the cost of the truck and most of the initial kitchen equipment. But, remember, you get what you pay for. A food truck is first and foremost a vehicle, and you want it to be reliable for transportation as well. Having a mechanic or two check it over can save a lot of money in the long run. Forbes magazine estimates that an average cost for a food truck is closer to $50,000 to $70,000 for a gently used truck and “reasonable” remodels. If you are willing to spend up to $100,000, you can get extra bells and whistles, or a new truck entirely. It’s true that food trucks are relatively inexpensive to open when compared to a traditional restaurant, and the overhead is generally small. But remember, once you get the food truck on the road and ready for business, a number of costs are still associated with the day-to-day operations, including insurance, permits, and other fees. Food costs, staff wages, transportation, and insurance will amount to almost all of your daily operating costs. In cities like Portland and Los Angeles, securing permits can be a nightmare if you are not prepared with the required paperwork on the deadline. Some food truck owners also rent out a commercial kitchen for meal preparation, which involves another monthly fee. Another option is to let your restaurant, if you have one, use the truck when you're not open, possibly securing kitchen space for free or a lower cost. As with any new restaurant, financing a food truck requires a business plan. Small business administrations, banks, or private lenders and investors are all options. You may even have enough assets to liquidate that you could come up with the startup funds yourself, eliminating interest payments. As you create your food truck business plan, consider your menu, your target customers, and your marketing approach. It's also worth considering backing from an established local restaurant that does not have a food truck. You might find a local restaurateur willing to invest in your food truck as a means of extending her own brand. If you are willing to partner with someone else, this has the added benefit of allowing you to enter the market with a brand name and possibly some menu items already familiar to the local community. You can then leverage this knowledge with a bank if you decide to start your own food truck later, bringing better terms since you will by then have a clear understanding of the business. Food truck owners shared with FoodTruckr what they wished they’d known before going into business. Many comments mention a lack of understanding of licensing and permits as a major issue. The process sometimes can take months. Regulations vary from state to state, and the process is often much more expensive than anticipated. Understand also how food trucks are utilized in your area. 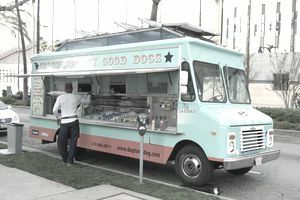 The food truck climates in New York City and Los Angeles are different than in Chicago or Boston, and markets in large cities overall likely are different than those in most smaller communities. Don’t assume that what works in one area will automatically work in another. Spend considerable time researching your own target market to help you better understand local challenges and needs within the food community.